Let’s talk about Carnival Fascination… when you step aboard this ship, you’re not only about to start a fun cruise, you’re about to enter a different world. Let your inner star out as you wander among the Hollywood-themed decor all around. You’ll also find all the fun perks you look for in a Carnival cruise: resort-style pool, Serenity Adult Only Retreat, mini-golf course… oh, and the very splashy Carnival WaterWorks. Plus – among the many activities on Carnival Fascination – you’ll meet the stars of the Dr. Seuss world at Seuss at Sea, where these wacky, lovable characters bring to life stories, a parade and (would you believe it?) even breakfast! 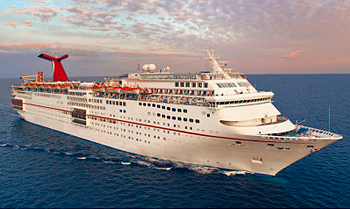 View all Carnival Fascination cruises or view more options for Carnival cruises. Hope you packed your funny bone . our onboard comedy performances are designed to tickle ’em just right. Serenity’s the faraway place… that’s actually quite close to it all. Grab a seat in our main stage area for a performance that may literally knock your socks off (or lfip flops) off. Welcome to the ultimate hot spot for guest ages 12 to 14. And with all this fun happening, they’ll be LOLing in no time. At Camp Ocean, 211 year-olds stay busy, keep active and have fun as they enjoy all new ocean-themed activities in supervised, age-based groups. This is Club O2, the just for teens hangout on board Carnival. Concerts and cruises – both absolutely rock. See a great band while you cruise with fellow fans. Hope you packed your funny bone, because renowned comedian George Lopez is helping us make our comedy club funnier than ever. Toss it, stretch it, sauce it and cheese it – add toppings and enjoy your own personal pizza. There’s no place at sea as welcoming as the atrium – the welcome-aboard center. B-I-N-G-O, B-I-N-G-O, B-I-N-G-O … this BINGO is a game-o. Come in, sit down and log on for a cup and a catch-up. You don’t need a translator to have a great time at this fiesta. Stuffing goes in. New friends come out. Get that classic ‘just went to the salon’ look while you cruise. Do good. Feel good. And help some kids – also good, right? We wonÂt just treat you, we’ll treat you well. Put your skills – and a little luck – to the test. From the classics to the modern, you’ll learn something new at our onboard art seminars. Just like karaoke, except you’re fronting a live band. So basically, not like karaoke at all. This poolside grill serves up poolside classics.